Account Number: Your account number is located in the upper left hand corner of the bill detail. This unique number identifies the specific account set up under your membership for the meter being tracked by this bill. Many of our members have more than one meter (house, barn, shop, etc.) and therefore have more than one account number. Usage Chart: The usage chart is located in upper right hand corner of the statement. This chart reflects your kWh usage over the past 13 months. Most members use this chart to compare the current month's usage to a year ago. Meter Readings: These numbers are a record of your previous and present meter readings. Subtract the previous reading from the present reading and you will have the amount of kWh used in the billing period. kWh: kWh stands for kilowatt hour. The basic unit for pricing electric energy, equal to one kilowatt of power supplied continuously for one hour (or the amount of electricity needed to light ten 100-watt light bulbs for one hour). This is the amount of electricity you have used when you subtract the previous meter reading from the present meter reading. Energy Charge: The monthly kWh charges and the monthly customer charge combined. Operation Round-Up: The amount your electric bill is rounded up to the nearest dollar, allowing CHEC to establish a trust that allocates these available funds to help those less fortunate. PCA: The Power Cost Adjustment is an amount in $/kWh applied to your monthly kWh consumption to account for changes in the cost of wholesale power purchased from CHEC's power supplier that are above or below the power cost recovered in the base rates to the members. Amount Due: This number is the payment that is required by the due date. Below is a sample bill to assist you in understanding the billing format. 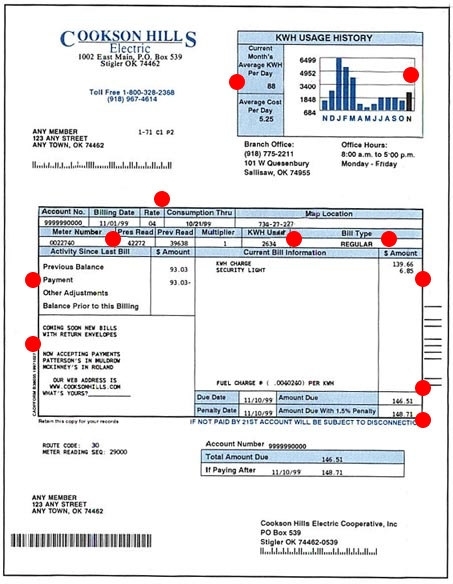 Click on the red dots to read each part of the bill.